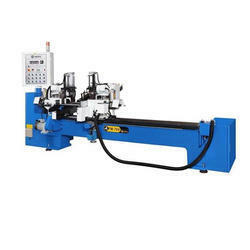 Providing you the best range of cnc tube benders, left and right tube benders, fa-111nc-sn tube cutting machine, fa-127nc-sn tube cutting machine, sa-78nce tube cutting machine and sa-77nc solid bar and heavy wall cutting machine with effective & timely delivery. The new SOCO CNC Tube Bender which is equipped with Left and Right Bending Technology for maximum flexibility and minimal interference. 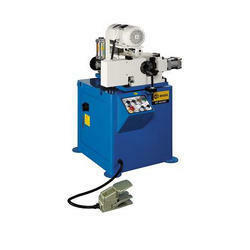 The “ U type” pipe bender is especially suitable for complex parts and shapes, such as automotive head rest, fuel lines, heating and cooling systems. 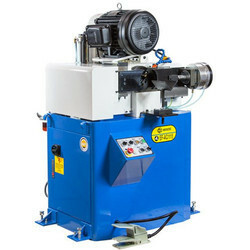 This pipe bender is equipped with 5 ~ 10 electric CNC axes, 2 ~ 3 bending stacks and uses SOCO’s unique DGT technology ( Direct Gear Transmission ). The new SOCO CNC Tube Bender which is equipped with Left + Right Tube Bending Technology for maximum flexibility and minimal interference. The “ U type” pipe bending machine is especially suitable for complex parts and shapes, such as automotive head rests, fuel lines, heating and cooling systems. 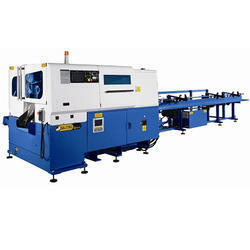 This pipe bender is equipped with 7 electric CNC axes, 2 ~ 3 bending stacks and uses SOCO’s unique DGT technology (Direct Gear Transmission). 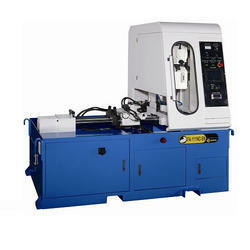 We are offering FA-111NC-SN Tube Cutting Machine to our clients. 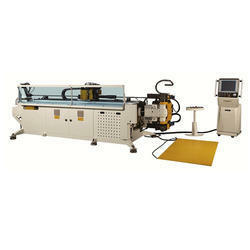 We are offering FA-127NC-SN Tube Cutting Machine to our clients. 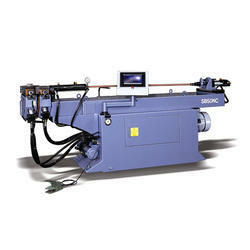 The new SOCO SA-78NCE brings you the latest technology in High Tensile Steel Tube Cutting. 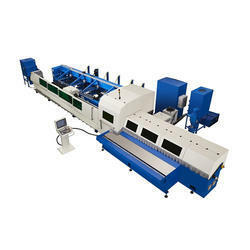 Its unique design and tube cutting system brings the highest saw blade life in such applications, as well as unparalleled performance and speed. The High Tensile Steel Tube is now widely applied in the global automotive market. In order to achieve higher fuel efficiency and lowering materials costs, thicker tubes and solid bars have been replaced by thin wall High Tensile tubes, which offer lower weight without compromising in strength and safety. With a much higher tensile strength (80~120 Kg/cm) than conventional steels (40~50 Kg/cm), this material is highly employed in key areas of cars in for structural (chassis) applications and impact protection. High Speed Sawing the average sawing cycle times can be up to 4.5 seconds for most sizes. Safety covers for operational safety and minimizing noise levels. HSS saw blades mild and stainless steel. Together with SOCO's i2 (Intelligent Interface) control system and Touch Screen, the SA-78NCE offers precision and versatility, while allowing for quick setup times between different tube materials, sizes and lengths. 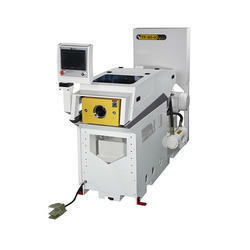 Length measuring tolerances of +/- 0.01mm. 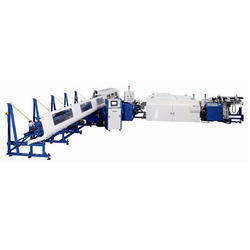 The new SOCO Tube and Solid Bar Cutting Line incorporates the newest technology with unparalleled functions. This revolutionary innovation brings you the unique loader ( MBLL6 ) , saving 70% labor and material changeover time ( SOCO Global Patent ). With capacity up to OD80mm in solid bar and tube cutting, it is guaranteed to bring you continuous savings and production. Using a thinner and smaller TCT Saw Blade, there is lower initial investment in blade andlong term savings in material. 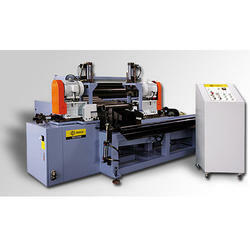 system, for even more savings on tube cutting. The SOCO TF Tube End Former Series is widely used in numerous end forming applications and industries, such as automotive exhausts, furniture, air conditioning, among others. These machines are different than conventional end formers, due to their low setup, high flexibility, superior precision and compact design. 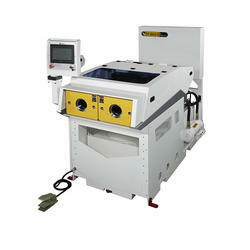 These machines go up to 82 mm in size, and incorporate hydraulic operation and touch screen control. 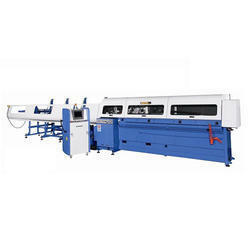 They may be fitted with 1 or 2 operating stations to process operations on tube ends and are suitable for both straight and bent tubular parts. 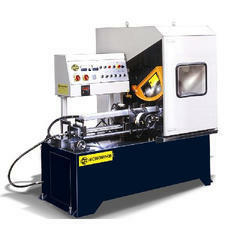 The C Type machines are designed for common end forming applications including tube expansion, reduction and slotting. The C type machines use segmented tooling consisting of expanding segments and reducing jaws, with extremely quick setup (drop down tools). 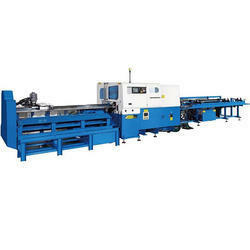 With similar capabilities as the C type, the E type adds a Ram and Vise Forming feature, which allows it to form even more complex shapes, such as various types of beading and flaring processes, among other kinds of end forming. The I/O type is used for precision sizing of tubes, and uses a combination of expanding segments and reducing jaws for accurate control of the inside and outside diameters. These can be sequenced in any order for improved accuracy and reduced ovality. The I/O also incorporates a touch screen control for quick setup. The I/O type is used for the highest accuracy and control of the inside or outside diameters (I.D./O.D.) of the tube. Unlike tooling systems used in the C and E type, the I/O type tooling is comprised of a set of inside expanding fingers and outside reducing jaws. These can be sequenced in any order to give improved sizing accuracy and minimal ovality. 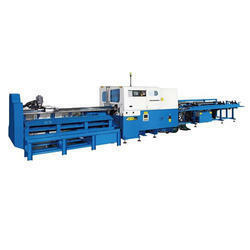 We are offering TF-80/2-IO Tube End Forming Machine to our clients. We are offering TF-80-2-IOE Tube End Forming Machine to our clients. 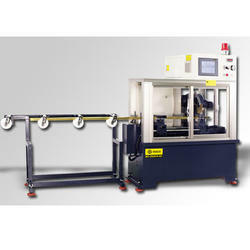 The NC series tube bender equipped with NC control unit with Touch Screen Interface.SOCO NC series tube bender combines easy-to-use operation with high tube bending accuracy and cost effectiveness. 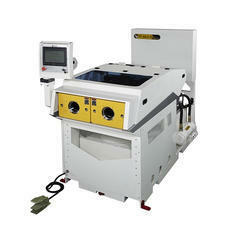 It is the practical semi-automatic solution for small to medium productions. Up to 9 programmable bends and 4 or 8 length stoppers. Length measuring tolerances of +/- 0.01 mm. The High Tensile Steel Tube is now widely applied in the global automotive market. In order to achieve higher fuel efficiency and lowering materials costs, thicker tubes and solid bars have been replaced by thin wall High Tensile tubes, which offer lower weight without compromising in strength and safety. With a much higher tensile strength (80~120 Kg/cm²) than conventional steels (40~50 Kg/cm²), this material is highly employed in key areas of cars in for structural (chassis) applications and impact protection. 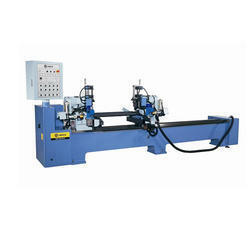 The new SOCO SA-78NCE tube cutting line brings you the latest technology in High Tensile Steel Tube Sawing. 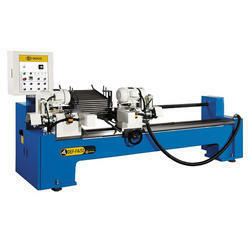 Its unique design and cutting system brings the highest saw blade life in such applications, as well as unparalleled performance and speed. 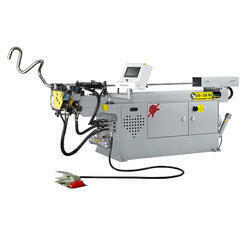 High Speed Sawing: the average sawing cycle times can be up to 4.5 seconds for most sizes. 1 or 2 optional length stoppers with Digital Length Readout. NC Length Stopper is available in optional. HSS saw blades: mild and stainless steel. Together with SOCO’s i2® (Intelligent Interface) control system and Touch Screen, the SA-78NCE offers precision and versatility, while allowing for quick setup times between different tube materials, sizes and lengths. We are offering FA-127NC Tube Cutting Machine to our clients. The new SOCO Tube and Bar Cutting Machine incorporate the newest technology with unparalleled functions. This revolutionary innovation brings you the unique loader ( MBLL-6 ) and unloader ( CL ) – saving 70% labor and material changeover time (SOCO Global Patent). With capacity up to OD80mm and 3000mm cutting length in long length solid bar and tube, it is guaranteed to bring you continuous savings and production. Using a thinner and smaller TCT Saw Blade, there is lower initial investment in blade and long term savings in material. HSS Saw Blades may also be used, with standard built-in settings and blade cooling system, for even more savings on tube cutting. 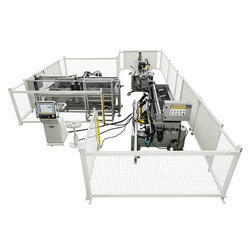 SOCO Recommendation System for ideal settings based on material and cutting requirements. Intuitive and user friendly interface with Touch Screen System. Ability to program 5 cutting lengths per bar. We are offering SA-77NC-CL2 Solid Bar & Heavy Wall Cutting Machine to our clients. Digital screen displaying cutting length for easy adjustment. Rigid structure with heavy-duty steel-fabricating base, to decrease vibration and improve precision in cutting. Specially designed changeable clamping jaws make replacement easy and fast. Suitable for Aluminum, Brass, Copper, PVC and Carbon Fiber cutting. Touch screen for easy operation and setting. Automatic cooling system for the work piece. 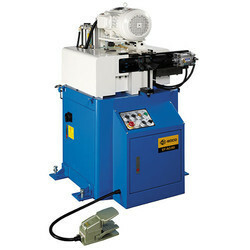 Automatic oil-mist system for the saw blade surface. Use of PLC to provide highest quality performance, convenient operation, and easy maintenance. 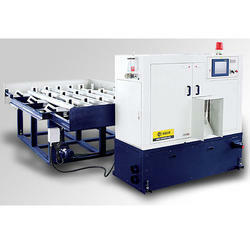 Built-in protective sensor prolongs saw blade shelf life and ensures safety operation. Specially designed for cutting non-ferrous material: Aluminum, Brass, Cooper, PVC, Carbon Fiber…etc. 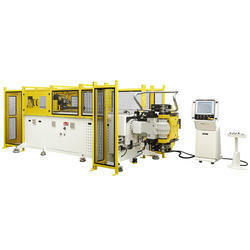 SOCO’s introduces its newest generation in tubes and profiles processing technology – the Fiber Laser Tube Cutting System. and the new Laser Tube Cutting Line is the ultimate solution for joining multiple machining processes in one system for maximum flexibility, automation and performance. 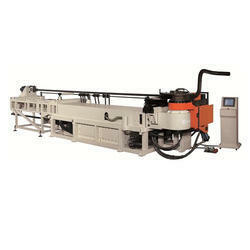 We are offering SA-77NC-CLS Solid Bar & Heavy Wall Cutting Machine to our clients. Programmable Rejection Rates – the operator may choose for the machine to stop after a certain number of pieces (continuous or separate) does not fall within the specified length tolerances. Ability to inside + outside ( I/O ) chamfer as deep as 15mm or angles as small as 15 degrees. The Gantry transport system (FM-60ss) and “Walking Beam” system (FM-76V) ensure that the work pieces are not damaged or scratched through the entire machining process. With the SOCO DEF series Chamfering Machines for long lengths, it is possible to simultaneously chamfer both ends of a tube, with up to 2000mm in working length. With an optional BTM (Bundle Magazine), the machines may offer a completely automatic loading, feeding and chamfering process. This range is suitable for cleanly and evenly chamfering both ends of the tube, as well as chamfering the inside, outside and face of the material. External and internal chamfering with facing in one process for double sides of tube, with optional radius (round) chamfering. C TypesThe C Type machines are designed for common end forming applications including tube expansion, reduction and slotting. The C type machines use segmented tooling consisting of expanding segments and reducing jaws, with extremely quick setup (drop down tools). Digital screen displaying tube cutting length for easy adjustment. Suitable for Aluminum, Brass, Copper, PVC and Carbon Fiber Tube and Bar sawing. 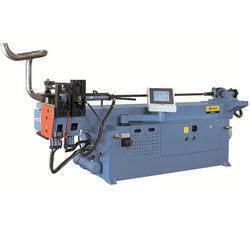 We are offering HHS-610NFA-NC Non-Ferrous Cutting Machine to our clients. The SOCO EF Chamfering series extends up to OD 115 mm in capacity. These semi-automatic machine models offer different functions such as universal clamping jaws for various tube sizes (EF-AC/115-U Type). The process is suitable for single tube end chamfering and available for solid bars. The Chamfering may be done on the tube’s inside, outside and face with a clean and accurate process. 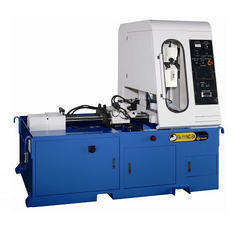 We are offering EF-AC-80 Tube End Finishing Machine to our clients. The SOCO EF Chamfering series extends up to 115 mm in capacity. These semi-automatic machine models offer different functions such as specific clamps for each tube size or universal clamping jaws for various tube sizes (EF-AC/115-lJ Type). The process is suitable for single tube end chamfering and available for solid bars. 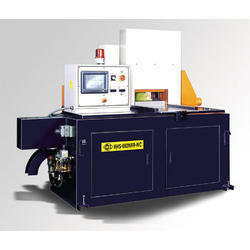 Looking for Soco Machinery ?